Stations 1, 19 and 27 responded to a fatal MVC in the 2900 block of Robertson Blvd. at 0144 Sunday morning 28-September. 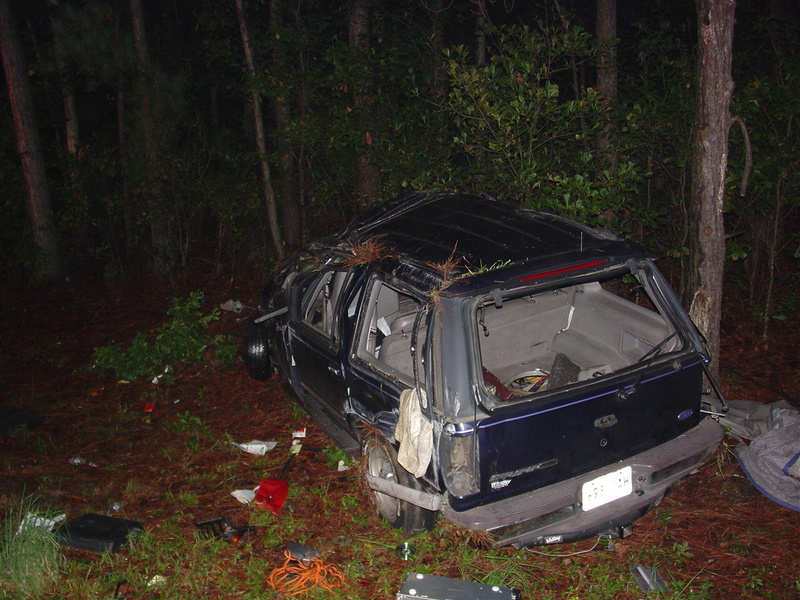 A northbound 2003 Suburban, traveling at a high rate of speed, lost control while attempting to pass another northbound vehicle. The Suburban flipped over multiple times after leaving the roadway and crossed the entire parking lot of Smith's Backhoe Service, coming to rest approximately 115 yards from where it first left the roadway. Click here for more information. 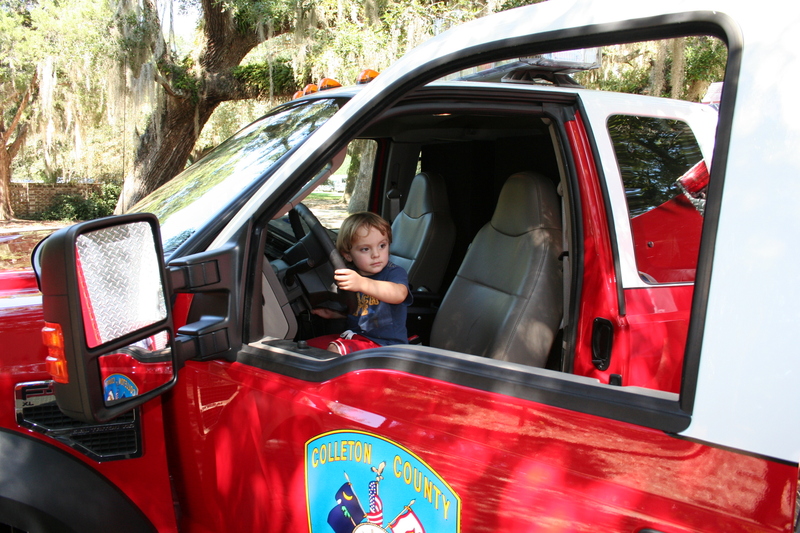 Fire-Rescue participated in the Fall Festival at Boonie Doone Plantation on Saturday 27-September. Firefighter-Paramedic Ben Heape and Engineer-EMT-I Chuck Moyer spent most of the day explaining their jobs and the tools of the trade to some of several hundred attendees. Medic 6, Engine 30 and Battalion 1 were on display. A steady crowd viewed the equipment and toured the apparatus. Heape and Moyer discussed fire safety with the children while showing off the equipment. Click here for more information. Stations 3, 10, 15, 18 and 23 responded to a dwelling fire at 50 Mingo Lane near Stephens Crossroads Saturday morning 27-September at 0445. Engine 18 arrived and reported the single lane dirt road was not passable by fire apparatus. The two prior days of rain had turned the dirt road into a soupy mess. Engine 18 set up on Carter's Ford Road at the head of Mingo Lane. Click here for more information. Stations 19, 26, and 27 responded to a MVC involving a loaded School Bus and a small car in the 1500 block of Jefferies Blvd near Dandridge Road. 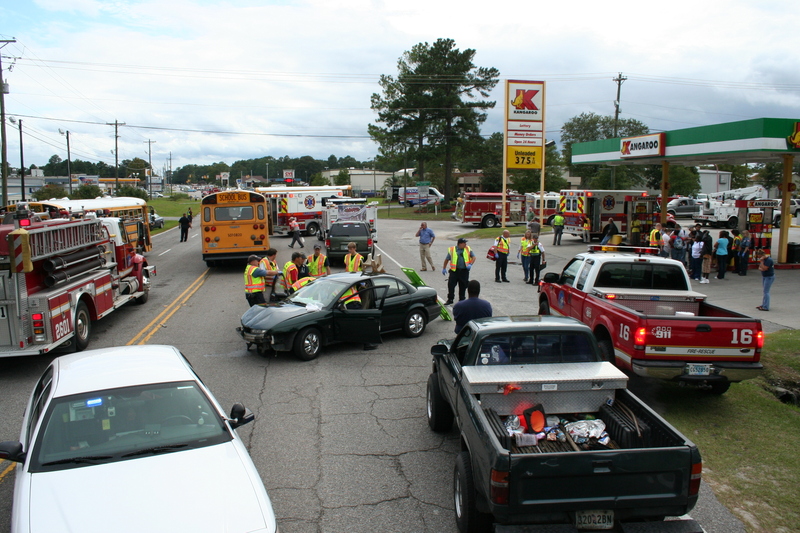 The accident occurred in front of the Kangaroo Gas Station at approximately 1515, Friday afternoon 26-September. Apparently the car was exiting the gas station onto Jefferies Highway when it pulled into the path of the southbound school bus. Click here for more information. Stations 1, 12, 19, and 24 responded to two buildings on fire at the intersection of Peurifoy Road and Gadsden Loop Wednesday 24-September at 13:30. Engine 19 arrived to report a storage building and small work shop well involved. It appeared the fires in both structures started from a grass fire. A doublewide mobile home on the property also received damage to the vinyl siding. Click here for more information. 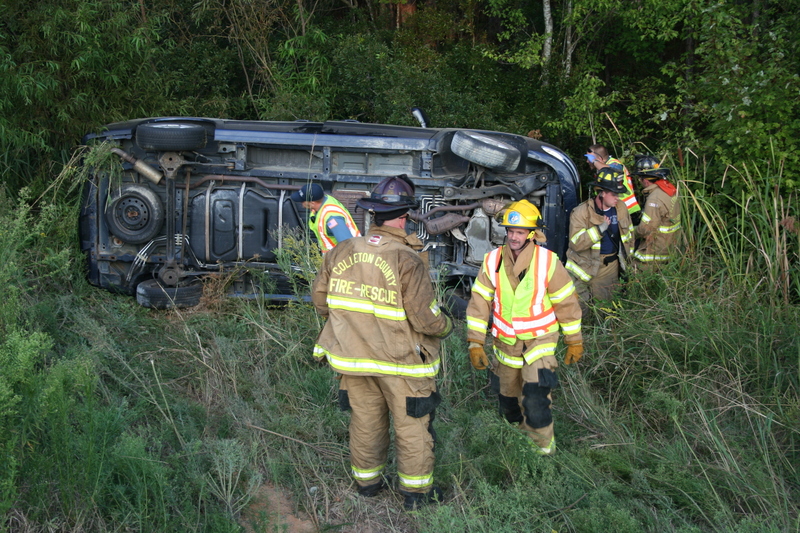 Stations 1, 5, 26 and 27 responded to an overturned vehicle on I-95 at the 68 mile marker northbound Tuesday evening 23-September. The accident occurred at approximately 18:12. The northbound mini-van lost control when the driver fell asleep, crossed two lanes of traffic before overturning and rolling down an embankment. 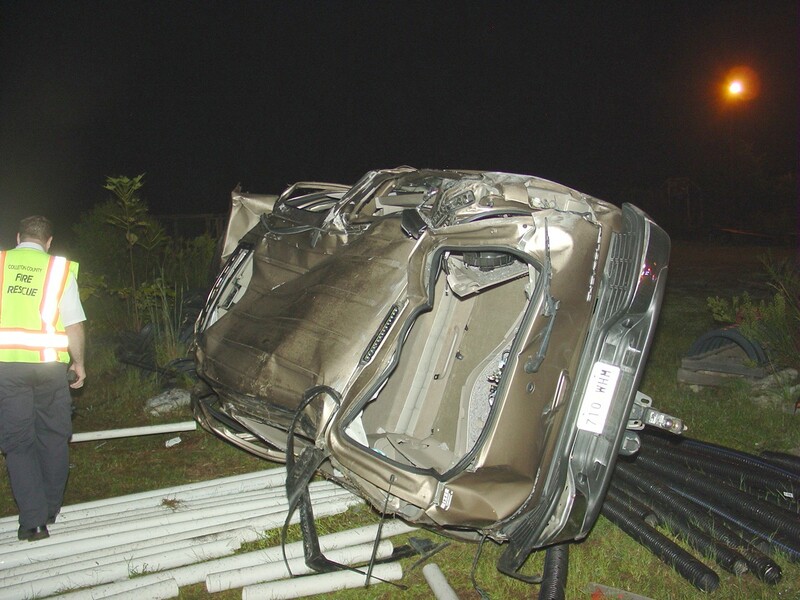 The two elderly occupants were wearing seatbelts and were not seriously injured. They were unable to exit the vehicle. Click here for more information. Station 9 responded to a two 4-wheeler accident off of Geechie Club Road Sunday afternoon at approximately 18:00. The two 4-wheelers collided off of the roadway, throwing the female driver some distance from the vehicle. Bystanders reported the patient was unconscious for a short period. She also received some broken bones. 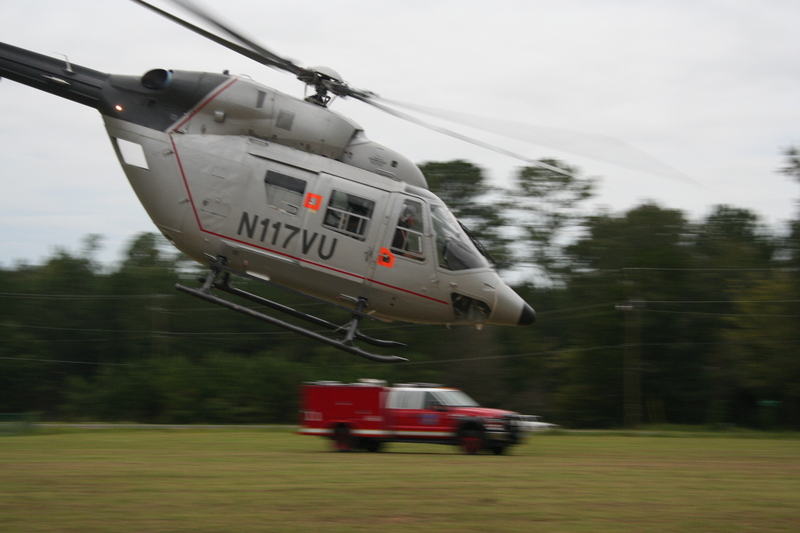 The crew decided the woman needed further treatment at a Trauma Center. Click here for more information. Congratulations to Station Captain Matt Williams (Station 15) and wife Jenny on the birth of a daughter. Madelyn Grace Williams born 9/19/2008 at 17:37 (5:37 PM) at Trident Hospital (7 lbs. 13 oz. - 20.5 inches long). Click here for pictures. Stations 1, 9, 19, 26 and 27 responded to a fatal MVC on I-95 near the 50 mile marker NB at the Crosby Corner Road overpass. Apparently, a northbound full size Ford Extended-van left the roadway at a high rate of speed and overturned multiple times. The van went up the overpass embankment, then tumbled down into a wooded area about 75 feet from the roadway. The van was not visible from the highway. Click here for more information. It is with great sadness that we report the passing of Ms. Betty Ann Polk of the Islandton Community. Ms. Polk is the wife of Firefighter Charles Polk at Station # 15 and has been a big supporter of the Fire-Rescue Program for more than 2-1/2 decades. She was always present at the Islandton Fire Station during fund raisers and the annual meeting. Ms. Betty completed the first firefighter class held at Station # 15, when it operated as the Islandton Fire Department in 1981. She has been active at the station in one fashion or another since the station was organized in 1980. She worked many years at the Islandton Post Office and retired three years ago as Postmaster. Visitation will be held at Brice Herndon Funeral Home on Bells Highway in Walterboro Monday evening from 6 PM to 8 PM. Funeral services will be held at Rice Patch Christian Church on Sniders Hwy. in Islandton, Tuesday morning at 11 AM. Stations 24, 1, 19, 12 and 27 responded to a well involved dwelling fire at 311 Seventh Street Sunday morning 14-September at 0551. Medic and Tanker 27 arrived to report heavy fire conditions from the "B" side of the singlewide mobile home. Crews used one 1-3/4 hand line from Tanker 27 to begin knocking down the fire. Engine 19 arrived a short time later and deployed a second 1-3/4 handline. Click here for more information. 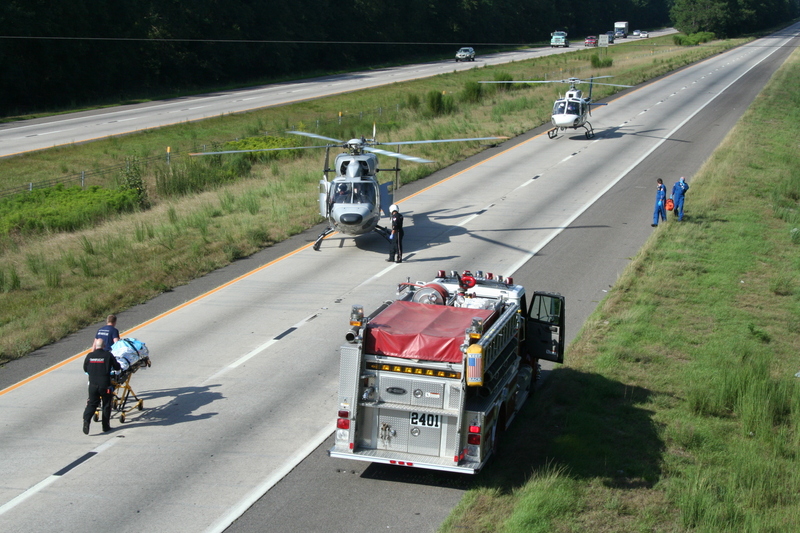 Stations 26, 27 and 19 responded to a motorcycle collision on I-95 at the 59 mile marker southbound Friday morning, 12 September at 0807 hours. First arriving units found a single vehicle involved with two patients. Meducare was requested and landed at the scene. Click here for more information. Colleton County Fire-Rescue hosted Firefighter Dave Graybill, an Arizona firefighter, and his fellow travelers, known as the Guardians of the Ribbon. 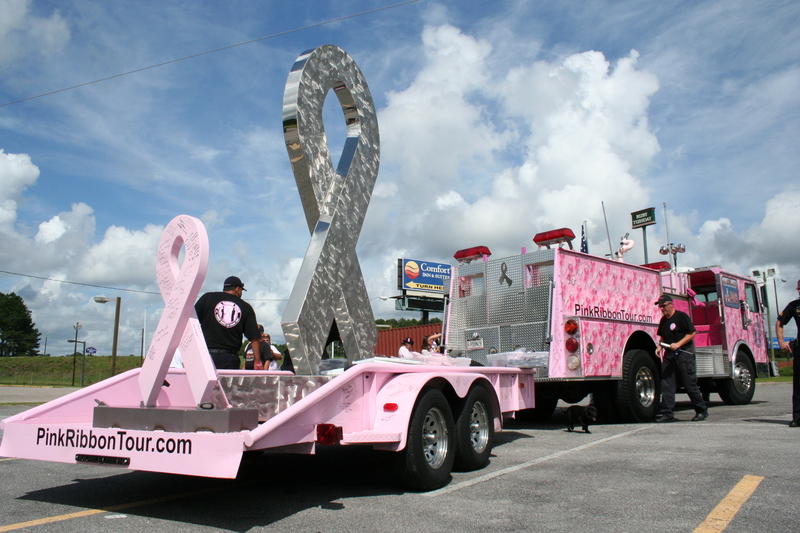 Graybill and his associates are driving a pink engine across the United States in an effort to raise awareness for breast cancer. Graybill spent the morning of September 9th with Chief McRoy and the crews of Medic 27 and Engine 1. Click here for more information. Colleton County Fire-Rescue received notification today from the Insurance Services Office that the Town of Williams is now included in the countywide Class 4 rating. 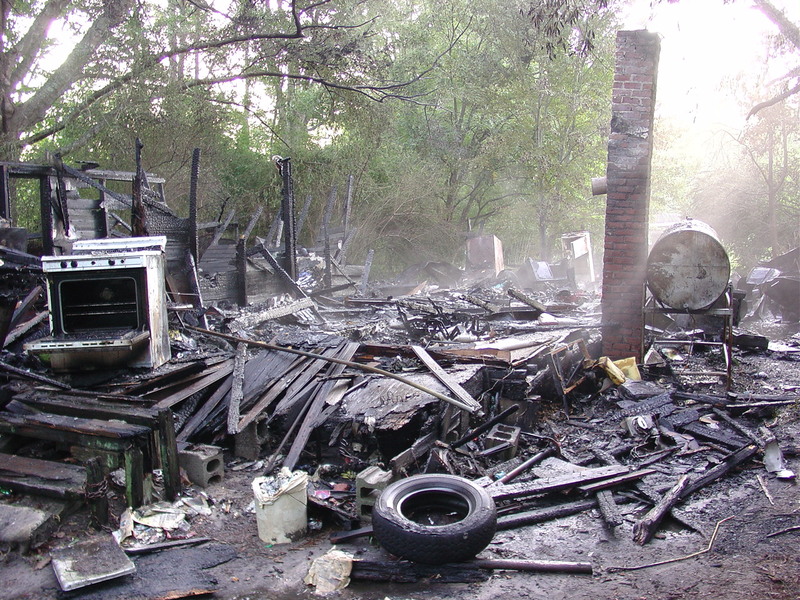 The rating is effective December 1, 2008 and applies to all structures within the town limits of Williams. 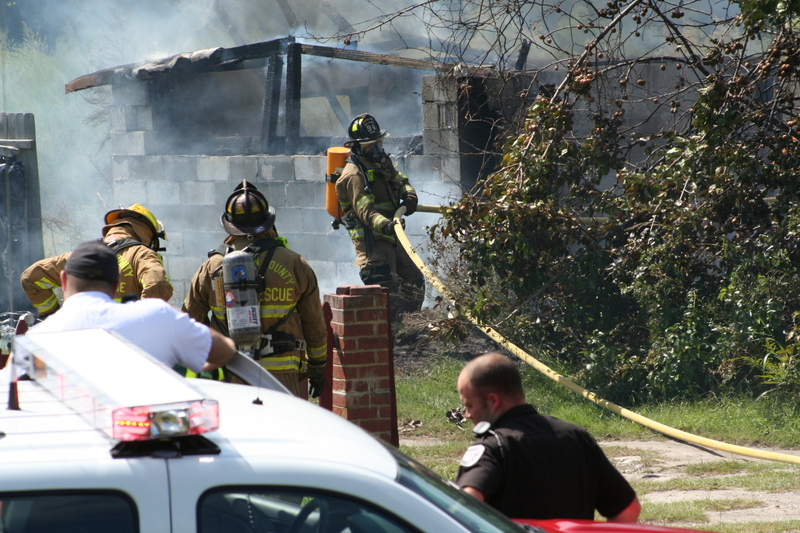 The previously established Class 4 rating applies to any buildings within five road miles of any Colleton County Fire-Rescue station, excluding residents of the city of Walterboro and Edisto Island. Residents in the Class 4 area enjoy lower insurance premiums. The Town of Williams became part of the county Fire-Rescue system two years ago. 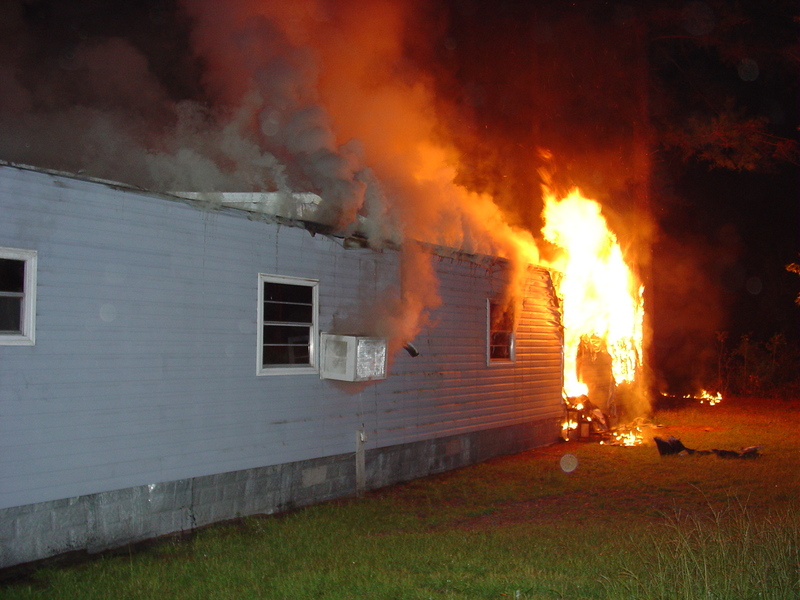 The addition increases the reach of Colleton County's ISO Class 4 coverage which maintains the largest full-service, all-hazards fire-rescue department with such a rating in the United States. 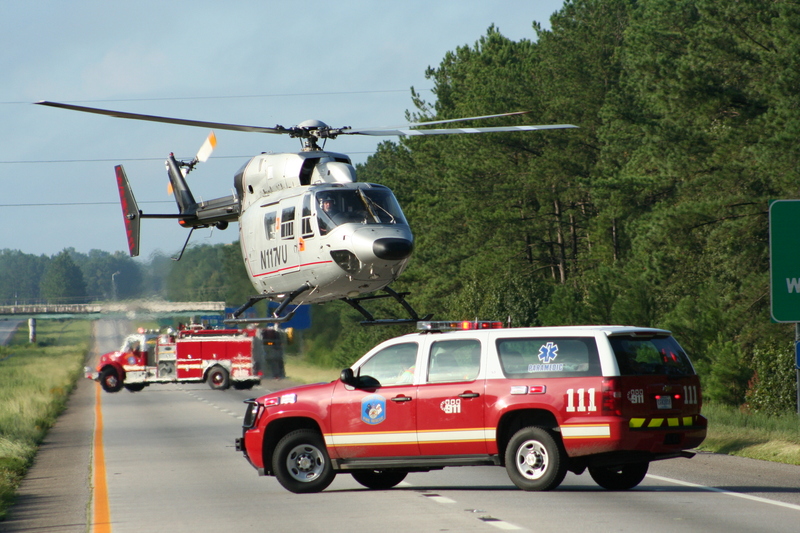 Stations 1 and 27 responded to a high speed roll-over accident on I-95 at the 41 mile marker southbound Monday morning 1-September at 0150. The southbound, older model Ford Explorer left the roadway at a high rate speed, flipping over several times before striking a tree. The 35 year old driver, who was not wearing a seatbelt was ejected. He was found semi-conscious about 15 feet from the car. Click here for more information.